The digital rack mixer X AIR XR18 from Behringer is incredibly versatile and flexible. 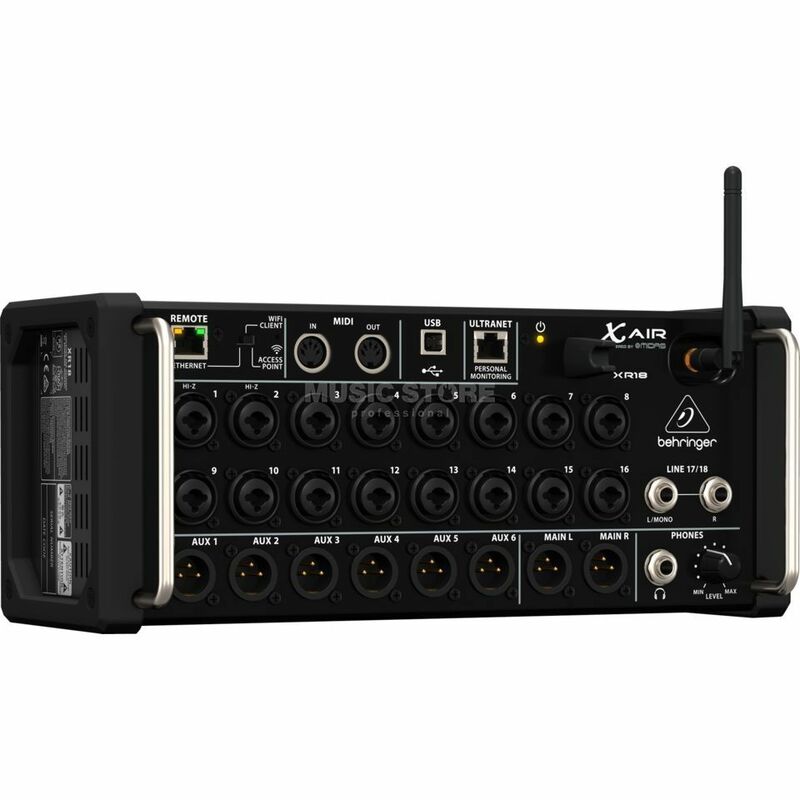 The 18 analog inputs, 4 internal stereo effect processors (8 Mono), a large number of classic effects in studio quality and simple operation via a PC or Tablet – regardless if iOS, Android, Mac, Linux or Windows – makes the X AIR XR18 a unique rack mixer, which perfectly suited for the high demands of live performances as well as studio recording. 16 Jack/XLR ins, 2 Hi-z ins + 2 aux ins. Phantom power for each preamp. Quality of preamps is not bad. Integrated DSP with 40 bit depth and lots of high quality legenday effects. Thereis only one out for headphones. Power supply for 100-240V, 60/50 Hz. Very good mixer for that price! I'm very satisfied! However, the mixer needs an external wifi router. A pandora's box for live use, this is a game changer. Very nice sounding preamps and the ability to multitrack 16 channels live is excellent. The iPad app is a bit clunky but if you run it hardwired on Mac it's perfect. Wireless has a few dropouts but generally works ok.
For the price, this can't be beat. Very good mixer. Just download either the app for iPad or the computer app. I was operational in 15 minutes. Good selection of powerful effects and easy-to-use equaliser. Also individual phantom power for condenser mikes. Very complete! Used the mixer for a concert with 7 mikes and 8 instruments with two busses for the monitors. The setup and adjustments through the iPad made it very easy to get at good sound quickly without having a 30m stagebox and an analogue mixer. Note: Due to a wireless system in the same room and audience use of wifi I could not get a stable wi-fi connection to the mixer during the concert. It was therefore wired through Ethernet to a laptop. Under these circumstances an external wifi router is definitely needed to ensure connectivity. Behringer does not deliver an iPhone app but the "X Air FMP" at 8.99 works really well for quick settings. For normal use the screen is simply too small and the iPad or laptop is required.